For the German municipality, see Grasberg. The Grasberg mine is the largest gold mine and the second largest copper mine in the world. It is located in the province of Papua in Indonesia near Puncak Jaya, the highest mountain in Papua. It has 19,500 employees. It is mostly owned by Freeport-McMoRan (FCX), which owns 48.74% of PT Freeport Indonesia (PT-FI), the principal operating subsidiary in Indonesia, including 9.36% owned through its wholly owned subsidiary, PT Indocopper Investama. The government of Indonesia owns 51.23% of PT Freeport Indonesia through Indonesia Asahan Aluminium. FCX operates under a Contract of Work (CoW) agreement with the government of Indonesia, which allows Freeport to conduct exploration, mining and production activities in a 27,400-acre area (Block A). It also conducts exploration activities in a 413,000-acre area (Block B). All of Freeport's proven and probable mineral reserves and current mining operations are located in Block A. The mine has three mining operations: the open pit, the Deep Ore Zone underground mine, and the Big Gossan underground mine. A fourth, the Deep Mill Level Zone, is being developed. The 2016 production was 1,063,000,000 pounds (482,000,000 kg) of copper, 1,061,000 ounces (30,100,000 g) of gold; and in 2016 sales of 2,900,000 ounces (82,000,000 g) of silver. In August 2017, FCX announced that it will divest its ownership in PT-FI so that Indonesia owns 51%. In return the CoW will be replaced by a special license (IUPK) with mining rights to 2041 and FCX will build a new smelter by 2022. In 1936, Dutch geologist Jean Jacques Dozy was a member of an expedition that scaled Mount Carstensz, the highest mountain in the Dutch East Indies. While there, he made notes of a peculiar black rock with greenish coloring, and spent several weeks estimating the extent of the gold and copper deposits. In 1939, he filed a report about the Ertsberg (Dutch for "ore mountain"). He was working for Nederlandsche Nieuw Guinea Petroleum Maatschappij (NNGPM), an exploration company formed by Shell in 1935, with 40% Standard Vacuum Oil Company interest and 20% Far Pacific investments (Chevron subsidiary). In March 1959, the New York Times published an article revealing the Dutch were searching for the mountain source of alluvial gold which had been flowing into the Arafura Sea. Geologist Forbes Wilson, working for the Freeport mining company in August 1959 after reading Dozy's 1936 report, immediately prepared to explore the Ertsberg site. In 1960 the expedition, led by Forbes Wilson and President of Freeport McMoRan Copper and Gold-George Mealey, confirmed the huge copper deposits at the Ertsberg. It was financed by Freeport Sulphur, whose directors included Godfrey Rockefeller, Texaco chairman Augustus Long, George Mealey, and Robert Lovett. In 1963 the administration of Dutch New Guinea was transferred to Indonesia, and the mine was the first under the new Suharto administration's 1967 foreign investment laws intended to attract foreign investment to Indonesia's then ruined economy. Built at 4,100 metres (14,000 ft) above sea level in one of West Papua's most remote areas, it involved a capital and technology input well beyond Indonesia's resources at the time. Construction cost was $175 million, $55 million above the original budget. A 116 km road and pipeline, port, airstrip, power plant and a new town called "Tembagapura" (literally: copper town) were built. It officially opened in 1973 (although the first ore shipment was in December 1972), and was expanded by Ertsberg East, which opened in 1981. Steep aerial tramways are used to transport equipment and people. Ore is dropped 600 metres (2,000 ft) from the mine, concentrated and mixed with water to form a 60:40 slurry. The slurry is then pumped through a 166 km pipeline through mountains, jungle and swamp to the port at Amamapare, dried and shipped. Each tonne of dry concentrate contains 317 kilograms of copper, 30 grams of gold and 30 grams of silver. In 1977 the rebel group Free Papua Movement attacked the mine. The group dynamited the main slurry pipe, which caused tens of millions of dollars in damage, and attacked the mine facilities. The Indonesian military reacted harshly, killing at least 800 people. By the mid-1980s, the original mine had been largely depleted. Freeport explored for other deposits in the area. In 1988, Freeport identified reserves valued at $40 billion at Grasberg (Dutch, "Grass Mountain"), just 3 kilometres (1.9 miles) from the Ertsberg mine. The winding road to Grasberg, the H.E.A.T. (Heavy Equipment Access Trail), was estimated to require $12 million to $15 million to be built. An Indonesian road-builder who had contributed to the Ertsberg road took a bulldozer and drove it downhill sketching the path. The road cost just $2 million when completed. The 2003–2006 boom in copper prices increased the profitability of the mine. The extra consumption of copper for Asian electrical infrastructure overwhelmed copper supply and caused prices to increase from around $1500/ton to $8100/ton ($0.70/lb to $4.00/lb). In 2005, the New York Times reported that between 1998 and 2004 Freeport had given senior military and police officers and military units nearly $20 million. The workings include a very large open pit mine, an underground mine and four concentrators. The open pit mine – which forms a mile-wide crater at the surface – is a high-volume, low-cost operation, producing more than 67 million tonnes of ore and providing over 75% of the mill feed in 2006. Ore undergoes primary crushing at the mine, before being delivered by ore passes to the mill complex for further crushing, grinding and flotation. Grasberg’s milling and concentrating complex is the largest in the world, with four crushers and two giant semi-autogenous grinding (SAG) units processing a daily average of 240,000 metric tonnes of ore in 2006. A flotation reagent is used to separate a copper-gold concentrate from the ore. Slurry containing the copper-gold concentrate is delivered by three pipelines to the seaport of Amamapare, over 70 miles away, where it is dewatered. Once filtered and dried, the concentrate – containing copper, gold and silver – is shipped to smelters around the world. The facilities at the port also include a coal-fired power station, which supplies the Grasberg operations. Freeport's Contract of Work Area. Deep purple in the river is mine tailings (2003). The concentrator's tailings, generated at a rate of 700,000 tonnes per day, are the subject of considerable environmental concern, as they wash into the Aikwa riverine system and Arafura Sea. Some 130 square kilometres (50 sq mi) (eventually 230 square kilometres (89 sq mi)) of lowland areas along the Aikwa River, are covered by braided sedimentary channels indicative of high sediment load (similar to glacial runoff). Native fish have nearly disappeared from now-turbid waters of the Aikwa River which are unsuitable for aquatic life. The overburden (700 kt/d)  remains in the highlands, up to 480 m deep and covering 8 square kilometres (3 sq mi). Its acidic runoff, dissolved copper, and the finer material gets washed into the headwaters of the Wanagon River. It settles out along the river course and then into the ocean, and will continue to do so indefinitely. Freeport's official response is that overburden is placed in the highlands as part of its Overburden Management Plan, at "sites capped with limestone and constantly monitored. Tailings are transported to the lowlands in a designated river system. Once reaching the lowlands, they are captured in an engineered system of levees built for that purpose." An Indonesian Environment Ministry's field report in 2004, found levels of sediment 37,500 milligrams per litre as the river entered the lowlands and 7,500 milligrams as the river entered the Arafura Sea, while the maximum under Indonesian law is not to exceed 400 milligrams per litre. In 1995, the Overseas Private Investment Corporation (OPIC) revoked Freeport's insurance policy for environmental violations of a sort that would not be allowed in the US. It was the first action of this sort by OPIC, and Freeport responded with a lawsuit against them. Freeport said an environmental report reached inaccurate conclusions, the result of a single 1994 visit to Grasberg. The company later underwent an independent environmental audit by Dames & Moore and passed. In April 1996, Freeport canceled its policy with the OPIC, stating that their corporate activities had outgrown the policy's limits. However, the OPIC report was later publicly released. The mine is located within what used to be a small equatorial mountain glacier. [not in citation given] Steepening of slopes related to mining activities, as well as earthquakes and frequent heavy rainfall, have resulted in landslides within the open pit mine. While landscape reclamation projects have begun at the mine, environmental groups and local citizens[who?] are concerned with the potential for copper contamination and acid mine drainage from the mine tailings into surrounding river systems, land surfaces, and groundwater. Freeport argues that its actions meet industry standards and have been approved by the requisite authorities. It was reported in 2005 that since 1997 Freeport had been breaching Indonesian environmental laws. Freeport estimates it will generate six billion tons of waste. Both Freeport and its partner Rio Tinto have been excluded from the investment portfolio of The Government Pension Fund of Norway, the world's second-largest pension fund, due to criticism over the environmental damages caused by the Grasberg mine. Stocks at a value of ca. US$870 million were divested from the fund as a result of the decisions. Violent ambushes near the Grasberg mine have occurred as early as August 2002, when three contract school teachers were killed. Kopassus, the Indonesian Special Forces, allegedly instigated the incident. A series of attacks started on 11 July 2009, and continued for more than five days. A Freeport employee, 29-year-old Australian Drew Grant was shot and killed while sitting in the back of a car on the way to a game of golf. Indonesian police indicated that Grant was killed by five shots he sustained to the neck, chest and stomach by unknown assailants using military-issue weapons. The attack also killed Freeport security guard Markus Ratealo and a number of police officers. On 7 April 2011, two Freeport employees were killed when the company car they were traveling in caught fire. Bullets were found inside the car, giving weight to the suspicion that the car was fired on by unknown gunmen. This incident sparked a protest by hundreds of Freeport employees concerned about the security along the jungle road leading up to the mine. 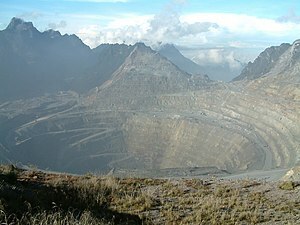 The Grasberg mine has been a frequent source of friction in Papua. Possible causes of friction are the mine's environmental impact on Papua, the perceived low share of profits going to local Papuans (Freeport's annual report shows it made $4.1billion in operating profit on revenue of $6.4billion in 2010) and the questionable legality of the payments made to Indonesian security forces for their services to guard the site. On May 14, 2013, a training facility tunnel collapsed trapping at least 33 workers underground. A mine official at the mine said three workers were killed, but the main office in Arizona said there were no fatalities. As of 20 May, 10 miners were rescued and 14 bodies were recovered bringing the total deaths to 17. Eleven other men are believed to be buried under the rubble. ^ a b Jamasmie, Cecilia (29 August 2017). "Freeport to yield control of giant Grasberg copper mine to Indonesia". MINING.com. Retrieved 16 October 2017. ^ "Grasberg Open Pit, Indonesia". Mining Technology. Retrieved 16 October 2017. ^ "Grasberg Minerals District". Freeport-McMoRan. Archived from the original on 14 September 2017. ^ "Indonesia officially controls 51.23 percent of Freeport shares:Jokowi". The Jakarta Post. Retrieved 21 December 2018. ^ a b c d "Indonesia". Freeport-McMoRan. Archived from the original on 2 September 2017. ^ "Our Project Area". PT Freeport Indonesia. Retrieved 9 October 2017. ^ "2016 Annual Report Freeport-McMoRan" (PDF). PT Freeport Indonesia. Retrieved 16 October 2017. ^ "Freeport-McMoRan Announces Framework for Agreement with Indonesian Government Regarding Long-Term Operating Rights for PT Freeport Indonesia" (PDF). PT Freeport Indonesia (Press release). 29 August 2017. Retrieved 16 October 2017. ^ Parrots, Lindesay (6 March 1959). "Dutch to explore New Guinea area - Remote Section of Disputed Territory Will Be Object of Intensive Research" (PDF). New York Times. p. 8. Retrieved 9 October 2017. ^ "Summary of AG-059 United Nations Temporary Executive Authority in West Irian" (PDF). United Nations. 26 May 2017. Retrieved 26 May 2017. ^ "Agreement between the Republic of Indonesia and the Kingdom of the Netherlands concerning West New Guinea (West Irian)". United Nations. 26 May 2017. Retrieved 26 May 2017. ^ McDonald, Hamish (1980). Suharto's Indonesia. Fontana Books. pp. 81–82. ISBN 978-0-00-635721-6. ^ a b c d e f g h i Perlez, Jane; Bonner, Raymond (27 December 2005). "Below a Mountain of Wealth, a River of Waste". The New York Times. Retrieved 9 October 2017. ^ "Mining for the Future. Appendix J: Grasberg Riverine Disposal Case Study" (PDF). Natural-resources.org. Archived from the original (PDF) on 2009-02-19. Retrieved 2010-07-25. ^ "Tailings Factsheet" (PDF). PT Freeport Indonesia. 2015. Retrieved 16 October 2017. ^ "Environmental Management Factsheet" (PDF). PT Freeport Indonesia. 2015. Retrieved 16 October 2017. ^ EnviroSearch International (9 September 1994). Final Report - Environmental Review of P.T. Freeport Indonesia Copper and Precious Metals Mine - Irian Jaya, Indonesia presented to the Overseas Private Investment Corporation (PDF) (Report). Austin Chronicle. Archived from the original (PDF) on 13 January 2006. ^ "Puncak Jaya indonesia – Google Maps". Maps.google.com. 1970-01-01. Retrieved 2010-07-25. ^ Norwegian Ministry of Finance (2008-09-09). "The Government Pension Fund divests its holdings in mining company". ^ Norwegian Ministry of Finance (2006-06-06). "Two companies – Wal-Mart and Freeport – are being excluded from the Norwegian Government Pension Fund – Global's investment universe". ^ Shorrock, Tim (10 December 2002). "US and Indonesia's military: Bedfellows again?". Asia Times. Retrieved 9 April 2011. ^ a b "Police detain 17 suspects in Freeport killings". The Age. 21 July 2009. Retrieved 9 April 2011. ^ Thompson, Geoff (13 July 2009). "Military, police 'among suspects' in Freeport killings". ABC. Archived from the original on 3 February 2010. Retrieved 9 April 2011. ^ a b "Freeport Workers Protest after Killings". Jakarta Globe. 8 April 2011. Archived from the original on 22 September 2012. Retrieved 9 April 2011. ^ "Two Freeport Workers Killed in Burning Car". Jakarta Globe. 8 April 2011. Archived from the original on 22 September 2012. Retrieved 9 April 2011. ^ "At least 33 missing after tunnel collapse at Freeport Indonesia mine". Reuters. Retrieved 14 May 2013. ^ "INDONESIA MINE COLLAPSE DEATH TOLL RISES TO 17". AP. Retrieved 20 May 2013. Wikimedia Commons has media related to Grasberg Mine. Freeport-McMoRan > Who we are > Our History Accessed 27 August 2013. "Grasberg Mine, Indonesia". NASA Earth Observatory. Archived from the original on 2006-09-30. Retrieved 2006-05-08.